← 10% off Breakfast all Week at Cafe Gaston! I had an hour to kill last night between activities and stopped by McD’s with the kids to grab a snack. While there my youngest asked if he could play in the bacteria-filled playplace. I hesitated but obliged since I had antibacterial wipes in my purse but couldn’t help but notice that I was getting the stink eye from another mom with small children. I let it go until she decided to say very loudly to another mom “isn’t he too old to be playing here?” He is about to turn 8, so no. Yes, he looks like he is older, but who the hell made her the nasty playplace police? I thought about saying something to her, but decided to do so via facial expressions and silent protest instead. A few minutes later, her young son started crying and was scared to come back down from way up high in the bacteria filled structure. She pleaded with him not to make her climb up to help him. Without a thank you or anything from the angry lady, he came back to see me. I hugged him and told him that was a nice thing to do and that he was such a nice person. “I’m always nice to smaller kids, I remember being small too. People should always be nice to each other, even strangers, right?” I wish some adults had the sense that my baby boy does. 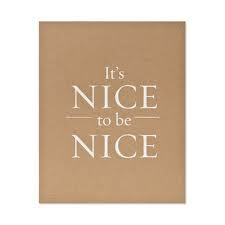 Have a nice day, and be nice to one another! This entry was posted in Everything else, Kids, Parenting, Uncategorized and tagged Be nice, kids helping others. Bookmark the permalink. 8 Responses to Be Nice! Your son was great – so nice of him. The lady should learn from him. Unfortunately, she probably won’t. But the important thing is what my son and hers took away from the ordeal, people are genuinely good. His mother may not be the best example of that, but oh well, we all have our bad days. True. It’s cool if her son does take awy the lesson you noted. Way to go, Adam! Please pass along my thank you … ’cause he made me smile!! Rene, that little man makes me smile every single day. I don’t know where he gets his sweetness from, but I adore it! I commend your son and you for taking the high road. It can be so easy to go the other way. And God don’t I know that!